A lightweight, easy-to-assemble system that allows for maximum motion dynamics in material handling applications has been developed by igus. The guidelite vertical systems ensures that vertically moving energy chains in highly dynamic applications are safely held in place while moving at high speeds. The system’s open design reduces resonance and noise and allows cable system speeds to reach more than 7 meters per second. Prior to igus’ new system, closed channels of sheet metal were frequently used for guide troughs. The enclosed design created an echoing body, which amplified an energy chain’s operating noise. The open design of the igus guidelite vertical system provides a cost-effective, noise-dampening solution and promotes safety. Modern applications where speeds above 7 meters per second occur require energy chain protection to prevent accidents. 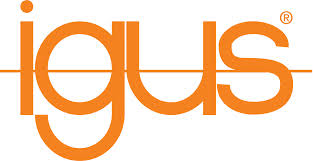 Igus launched he guidelok guide trough series for horizontal applications eight years ago. The guidelok products eliminate the disadvantages found in sheet metal or aluminum channels. Instead of using an enclosed sheet metal channel, guidelok has open, high-performance plastic 2,000 millimeter guide rails. The open design promotes noise-dampening and vibration-absorbing features while at high speeds. A special screw also ensures that counter-locking won’t be required and that the rails can be screwed with just one hand, allowing for easy assembly. The open design of the guide channel makes the maintenance area easy to access, so repairs can be done quickly when cables or energy chains are damaged. The use of plastic rails also reduces the overall weight of the trough and keeps costs down. The new GLV now brings those advantages to vertical applications as well.